The October 1, 2015 issue of the Troy Times-Tribune is now available. 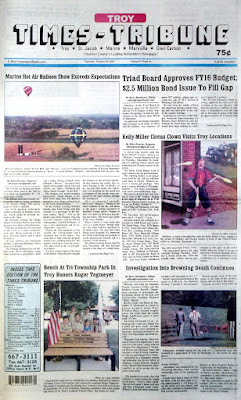 Some of the headlines in this issue: Triad Board Approves FY16 Budget; Kelly-Miller Circus Clown Visits Troy Locations, Marine Hot Air Balloon Show Exceeds Expectations, Investigation Into Drowning Death Continues, Bench at Tri-Township Park In Troy Honors Roger Tegmeyer, Maryville FD To Acquire New Cardiac Monitor/Defibrillator; plus we have new about upcoming events, an editor's column about Illinois politics, our usual “It Happened Here” history page, a full-page photo spread about the recent Hot Air Balloons over Marine event, a special Fire Prevention Week section, and lots more. This issue carried obituaries for Richard D. Bequette, Richard Brown, Sandra Lea Hults, Nancy “Nan” Johnson, Carroll C.J.” Lanahan, Joyce Liniger, Samantha Randolph, David R. Rickert St., and Mildred E. Worthen. Subscriptions to the Times-Tribune are available by calling 618-667-3111, by visiting our offices at 201 East Market Street in Troy, 8 a.m. - 5 p.m., Monday through Friday, or by sending us a letter asking to subscribe. To place a display or classified advertisement, please call or stop by our offices..